Just a few weeks ago Apple introduced the new iPhone devices, the iPhone 6 and iPhone 6 Plus. 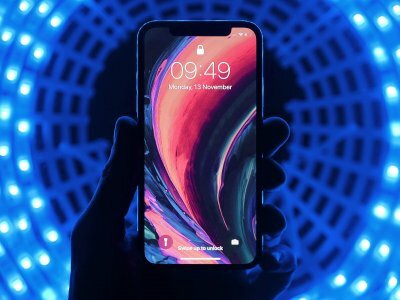 As we all saw, the screen sizes are bigger than all the older iPhone screens, meaning that any new applications must be build in that way so they work on all devices. Even more, if we consider the iPad screens, then the number of screen sizes that any application should adapt to becomes even greater. From a first point of view, that may seem a big hassle for developers, however that’s not true at all. In iOS 8, Apple introduces the so-called adaptive user interface or adaptive layout. With that new philosophy, application interfaces can be adjusted and configured pretty fast for any kind of display. With adaptive UI, some existing concepts have become deprecated, such as various delegate methods regarding the device orientation. On the other hand, new concepts are provided for easier and more general handling of the interface, and developers just need to get used to working with them. Anyway, in this tutorial I’m not going to discuss in depth about the adaptive UI, but as we are going to be in align with it, there are a few things that we will see in a bit more detail later on. Further than all the above, it’s well known that iOS 8 not only contains new features, but great improvements to existing ones as well. Of course, view controllers could not just stay out of those improvements, and that’s more or less what we are going to talk about. 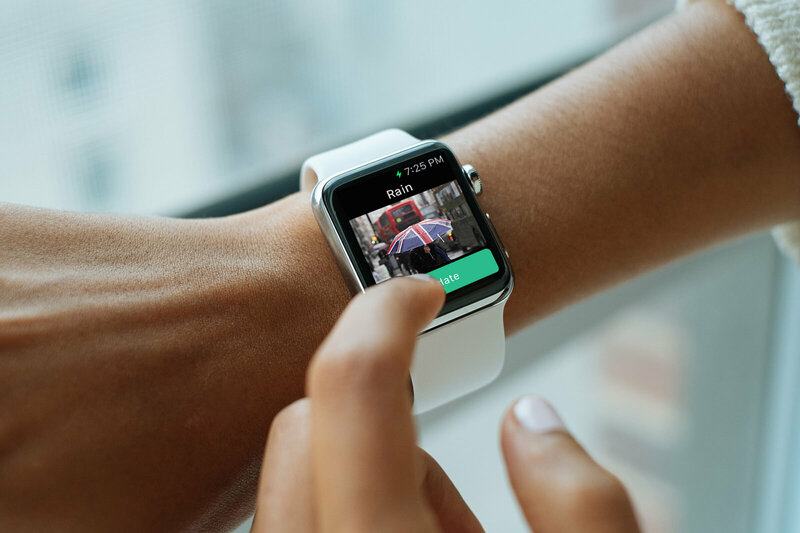 Specifically, we are going to focus on two special view controllers, the UISplitViewController and the UIPopoverViewController. Up to the seventh version of the iOS (iOS 7), both of these two view controllers could be integrated only in iPad applications. 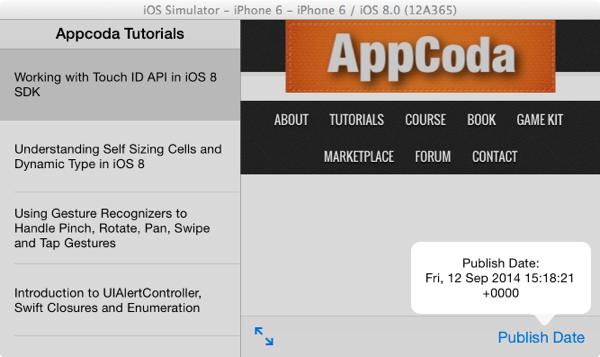 Now, the new iOS SDK allows us to use them in iPhone applications too, and that’s what exactly we are going to do here. My goal is to show you how you can add a split view controller and a popover view controller to an iPhone app, and how they can be displayed in all the available screen sizes. It might look a bit difficult or weird at the beginning how all that stuff works, but once you get the idea then you’ll be able to use them in every app you want. Besides all that, the code we will write is going to be in Swift. Right exactly as we did in my last tutorial, we will meet here also how various techniques can be implemented using Swift, and I believe that apart from the view controllers that we’ll examine, you’ll get extra benefits from the rest of our work as well. Lastly, as a piece of advice I would like to prompt you to watch the WWDC 2014 Session videos #214 and #216 regarding the new adaptive layout concepts, the split view controller and the popover view controller, if you haven’t still done so. Please take the time and watch them, as you will be able to understand a lot easier what we will discuss here afterwards. With no more delay, let’s get started! 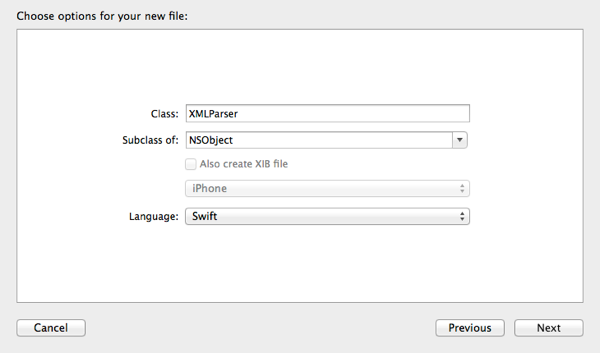 In a couple of older tutorials of mine, I used the NSXMLParser class of the iOS SDK for downloading and parsing data from the web. Here, we are going to use this class once again, but this time we will see how the related XML parsing code can be written in Swift (something that I consider quite useful for many developers who want to deal with XML in Swift). The source of the data that we will download and parse is going to be from our own RSS feed, the RSS feed of Appcoda. 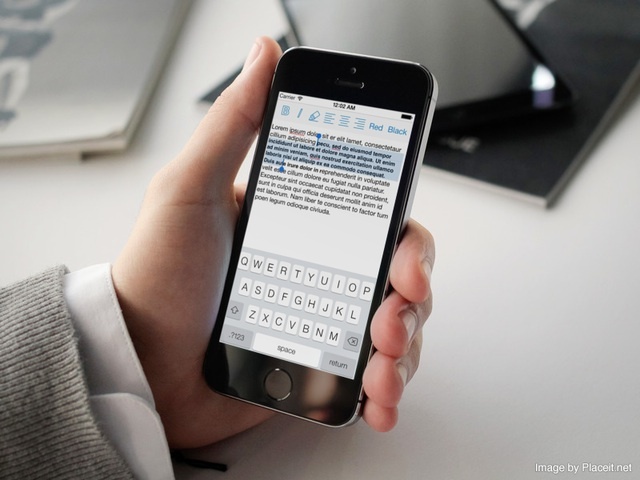 For the sample application of the tutorial, we will create a simple project for iPhone devices only. This application will contain just a split view controller, which we will configure programmatically so it properly works on iPhone. As you all know, a split view controller is composed by two other view controllers (children view controllers), a primary and a secondary view controller. Our primary view controller will have a table view (actually is going to be a table view controller), in which we will list all the tutorial titles. The second view controller will contain a web view and a toolbar. When a topic is tapped on the primary view controller, the whole tutorial will be loaded and displayed in the web view (we’ll provide it with the proper link). In the toolbar will exist two bar button items (plus a flexible space bar button item): The first one will toggle the display mode of the split view, meaning that it will make visible or not the primary view controller. In iOS 8, the UISplitViewController class provides a method that returns a bar button item that can be used to hide the primary view controller. In order to make it visible again, we will replace that default button item with a custom one of ours. Besides all that, we’ll implement the app in such way, so these two button items to be displayed only in the proper device orientation. Of course, the custom button item that will make the tutorial list visible cannot and won’t be appeared at the same time with the predefined button item of the SDK that we’ll use in order to hide the primary VC. Lastly, the second button item of the toolbar will display in a popover view controller the publish date of the displayed tutorial. 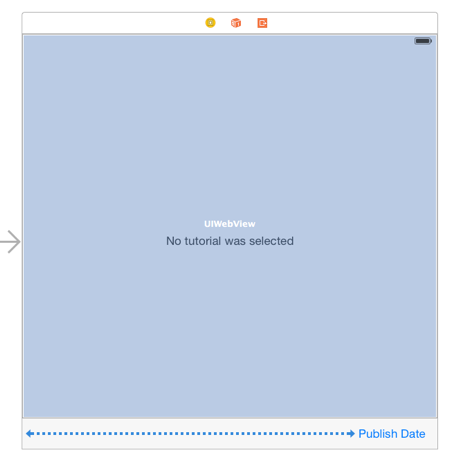 Let’s get started by creating a new Xcode project and by choosing the Single View Application template for it. You can set the SplitAndPopover value as the name for the app (that’s the one I used here), and make sure that the specified programming language is the Swift, while the selected device is the iPhone. Get finished with the project creation by selecting a directory to save it in. A UITableViewController that we’ll use as the primary view controller (of the split view controller which we’ll add next to the project). A UIViewController that we’ll use as the secondary view controller of the split view controller. A UIViewController class that we will use as a custom container view controller. There’s a specific section dedicated to that, so it’s okay if you’re not sure what’s this about. A NSObject class in which we’ll implement the XML data parsing functionality. In the last section of the tutorial we’ll create one more class regarding the popover controller, but for the time being we’ll focus on the above only. I’m just telling in advance that I want the above classes (files) to be created all together, so we can use them at once, starting from the next part of the tutorial. Go to the File > New > File… menu in Xcode. Create a Cocoa Touch Class. Set the proper Subclass of each class. Set the proper Class name. The table view controller class for the primary view controller of the split VC, named TopicsTableViewController. The view controller for the second view controller of the split VC, named TutorialViewController. The container view controller class, named ContainerViewController. The NSObject class, named XMLParser. Now that all the class files we’ll need are ready, let’s setup the interface of the app. Open the Main.storyboard file, and wait until the Interface Builder appears. The first step, is to add a Split View Controller from the Object Library to the canvas, so just locate it and drag it there. Then, you can delete the View Controller scene, and also you can delete the ViewController.swift file from the Project Navigator. Let’s setup now each view controller as needed. Select the Table View Controller scene (the one that the navigation controller points to), and set a custom class name by opening the Utilities pane and then the Identity Inspector. In the Custom Class section set the TopicsTableViewController value in the Class field. 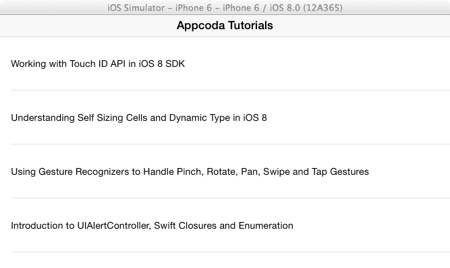 Also, replace navigation item title it with the Appcoda Tutorials value. 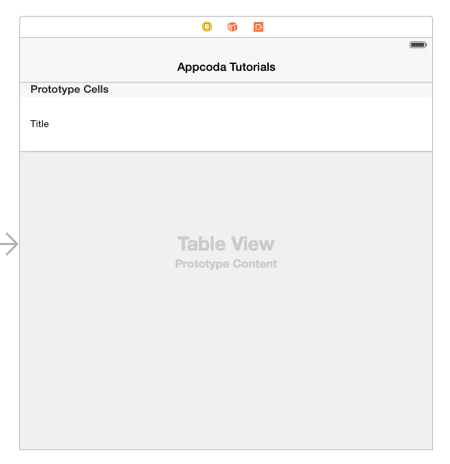 Then, select the table view cell prototype, and select the Basic style in the Attributes Inspector. Also, set the idCell as its identifier value. Next, open the Size Inspector, and set the Row Height to 80. By setting the basic style to the table view cell, a label is appeared on it. Select that label, set the font size to 14pt, and the its Lines to 3. Let’s continue by configuring the second view controller of the split VC. Begin as before, and set its custom class to the TutorialViewController value. Don’t rush to move forward however, as in this case we must specify a Storyboard ID value that we’ll need it later in code. For this one, specify the idTutorialViewController value. We’ll add some subviews now. At first, get a UILabel from the Object Library, and add it to the scene. Set the No tutorial was selected string as its text. Make sure then to move the label at the center of the scene. Click on the Align button at the bottom-right side of the Interface Builder, and check both the Horizontal center in container and Vertical center in container constraints. Next, drag and drop a UIToolbar object from the object library. Place it at the bottom side of the scene, and rename the existing button item to Publish Date. Also, get a flexible space bar button item and add it to the left of the existing button item in the toolbar. We’ll set the constraints for the toolbar in a while. Now, grab a UIWebView object from the library, and add it to the scene. Make sure to cover the whole space, except for the toolbar. The web view should overlay the label. Let’s setup the constraints for the toolbar and the web view now. Select the toolbar, and then click on the Pin toolbar at the bottom-right side of the IB. Enable the trailing, leading, top, bottom constrains, as well as the Height constraint by checking the respective checkbox. Add these five constraints. @IBOutlet weak var pubDateButtonItem: UIBarButtonItem! We are going to work with this method at the last part of the tutorial, when we’ll deal with the popover controller. Now, head back to the Interface Builder and do the proper connections. Select the Tutorial View Controller scene, and then in the Utilities pane go to the Connections Inspector. Select each IBOutlet property, and connect it to the appropriate subview. Don’t forget to connect the IBAction method to the bar button item too. The most of our work in the Interface Builder is now over. Quite later we’ll return, and we’ll add a new scene for the popover controller, but until then we are just perfect. Let’s keep going by writing some code! One of the first things that we are going to deal with in this tutorial is to download and parse the sample data of the demo application we are developing. As I said to the app overview section, the source of our data will be the RSS feed of the Appcoda website (this website), and it’s our duty to parse that feed and extract only the piece of data we need. I remind you that any protocol that is adopted by a class, must be declared after the parent class (in this case the NSXMLParserDelegate protocol is declared after the NSObject parent class). Notice that the data source URL is passed as a parameter to the function. Right now, the first two steps out of the three I listed before have been implemented. However, that was the “easy” part. The important and a bit more difficult part is coming, where we must implement all the required delegate methods of the NSXMLParserDelegate protocol, and to apply the proper logic so we can extract just the data we need out of the bunch that will be parsed. arrParsedData: This is an array that will contain just the parsed data we care about. Note that each object of this array is going to be a Dictionary of which both the key and the value will be String objects. We’ll see an example of the dictionary contents in a while. currentDataDictionary: This dictionary object will be used to temporarily store the parsed data of interest. After we have all the needed data of a parsed tutorial, we’ll add it to the previously described array. currentElement: This is a String object in which the name of the currently parsed element will be stored. We’ll need it to determine if every found element is of interest or not. foundCharacters: This String object will store the value of a node (an element) that we care about. When the end of the element is found, then its contents will be added to the currentDataDictionary dictionary and it will become empty again. If you look closely, you’ll find out that in the first condition we don’t just check if the current element is the title, but also if its value is other than the “Appcoda” string. I do that on purpose, as the returned XML data contains an element named “title” at the beginning of the XML that is not related to any tutorial topic, and it just has the “Appcoda” value. Anyway, that’s an action related to the specific data we parse. I do this also on purpose, because the characters “\n\t\t” are added to the beginning of the string when parsing the link element. The above command actually gets a substring from the foundCharacters string, starting at index 3. You see that after having added the found value to the dictionary, we empty the foundCharacters string again. The pubDate element is the last one of interest for each tutorial topic (in the order the data is parsed), so when that happens we are able to add the dictionary to the array. Our next move regards the action that we should take when the parsing is finished. In that case, we only need to inform the caller class that this has happened, and an easy way to do it is to use the delegation pattern (for more information about it, you could also check my previous tutorial, where I explain the steps involved in the delegation pattern in Swift in a bit more detail). So, let’s work on that. We declared just one delegate method, named parsingWasFinished. No parameters are needed, and it’s a void function. Notice that we didn’t implement the parserDidStartDocument method, simply because we didn’t need to do something in it. By doing the above, we’ll be able to implement the parsingWasFinished delegate method, and knowing that way when the parsing is over so we can reload the table view. Actually, as we are speaking about that, why don’t we implement it now? All the above is the minimum required implementation we needed to do for showing the tutorial topics in the primary view controller of the split VC. 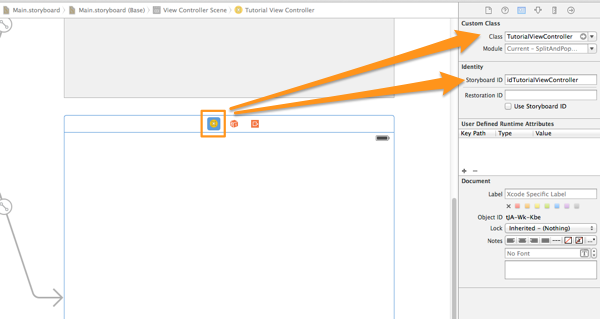 In the above code segment you can see what the view controller identifier we set in the Interface Builder is useful for. As you see, once we start loading the URL contents we make the web view and the toolbar visible again (if they’re hidden). All of the above consist of the code we need in both the TopicsTableViewController and the TutorialViewController classes in order to list all the parsed tutorial data and to display the proper one, after having selected a topic. With that mechanism ready and working, let’s focus on the split view controller and other new technologies in iOS 8. Before we begin the actual work with the split view controller and the rest of the stuff we are about to see, it’s necessary to talk about two new important concepts regarding the adaptive layout. These are the Size Classes and the Trait Collections, and without having the minimum required knowledge about them at least, it’s not possible to carry on. Of course, I recommend you to find more information in the Apple documentation or the respective WWDC videos in addition to what you’ll read here. However, if you are aware of these meanings and you feel comfortable with them, then you may skip this section, otherwise please be patient enough and keep reading. 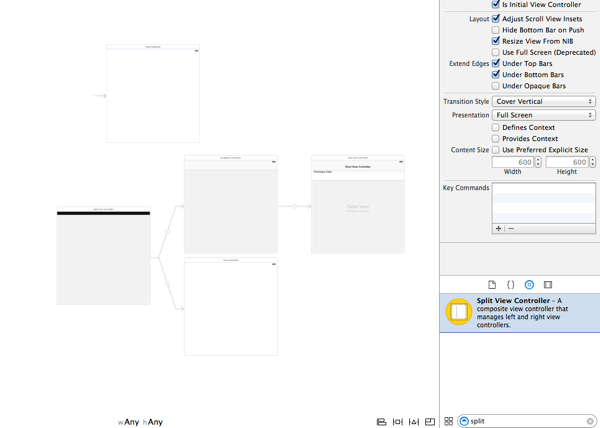 You can see the size classes in action, if you simply go to Xcode, and open the Interface Builder by clicking on the Main.storyboard file. At the bottom of the main window area, there’s a button writing wAny hAny. If you click on it, a new small window will appear, where you can specify any desired size class combination. At the same time, Xcode informs you about the target device of the currently set combination. The Any value means that the interface configuration will work to any device, no matter of the screen size. An extra benefit from this is that no different .storyboard files are needed for each device type when creating universal applications. So, as you can understand, we are no longer talking about 3.5 or 4 inch screens or anything else like that when designing the interface, we’re just talking about size classes. If, for example, you want to describe an iPhone screen, then you simply use the proper size class combination, depending on the orientation. … describes an iPhone in portrait orientation. The discussion about traits doesn’t stop here, on the contrary there is a lot more study one should do about it. However, the traits and trait collections are important for us in this tutorial just for one reason: Every view controller inherits the trait collection from its parent, and that inheritance is moving towards up in the hierarchy until the window object of the app. Our goal in the sample app we’re creating is to manage to override the inherited trait collection and to modify the size classes in order to properly display the split view controller when the device orientation gets changed. The new SDK provides some really useful methods do to so, and once you get the meaning of the trait collections you’ll see that overriding them is a super-easy task and in many cases the appropriate way to implement your app. Designing a user interface it’s not a simple thing, as that’s the main way for users to communicate with your application. If the user interface is poorly designed the users will probably never use your app more than a few times, no matter if the features it incorporates are the best ones existing out there. And when saying about UI design, I don’t only mean the graphics or the colors of it, but the structural elements that compose the app. So, making the correct decisions and choosing the proper view controllers and subviews in the development stage is vital for the life of the application once it goes live. Speaking more specifically now, it’s quite often for all of us to use special view controllers that work as containers for other, normal view controllers. 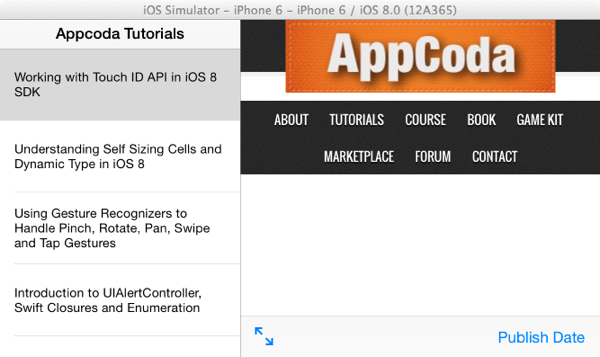 Typical examples of them provided by the iOS SDK could be the navigation or tab bar view controllers. There is a whole theory behind container view controllers that you should really read at some point here. Besides those pre-made and provided by the SDK container view controllers, developers can also create their own custom container VCs, for which you can also read in the previous given link. There are specific steps that should be followed every time that you implement one, and we’ll see them here pretty soon, but first, allow me to tell you why we need to create a custom container view controller in this application. As you’ll see yourself while we’re moving forward in this sample project, we won’t be able to properly display the split view controller unless we override the trait collection of its parent view controller. However, the parent of the split view controller is the application window itself (remember the design in the Interface Builder), and we can’t override its trait collections. So, we need a custom container view controller that will work as an intermediate between the window and the split view controller. The split view controller will be embedded to the container, and the container VC will become the root view controller of the window. At the end, the trait collection of that container VC is the one that we’ll override. Our work with the custom container view controller won’t be limited in this part of the tutorial only. Our initial implementation will take place here, however we’ll do new additions and modifications later on, when we’ll dive in the details of the split view controller. In this property we will assign later the split view controller that we have already added in the Interface Builder. 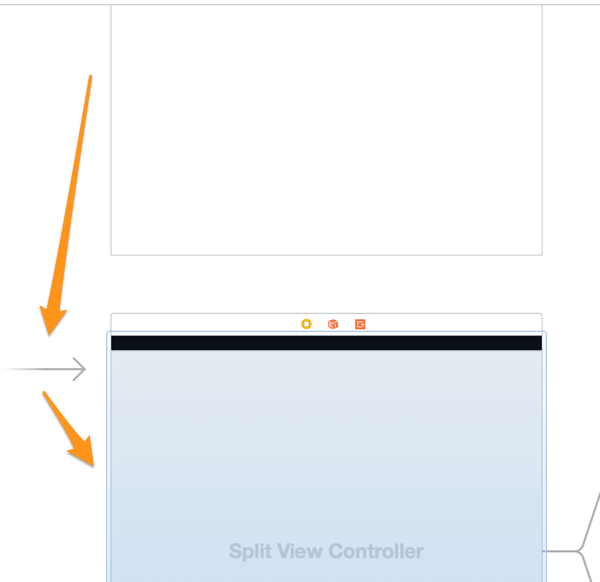 Next, we will implement a function which we will use to assign the split view controller to this viewController object. We can’t just do that directly, because when working with container view controllers there are specific steps that should be followed. These steps are described in detail in the official documentation by Apple (the link I gave you above), but they’re simple enough to be understood. Let’s see that function and then we’ll discuss a bit about it. indicates that the whole process is complete and the new view controller has been embedded to the container view controller. For the time being our work in this class is over. You might wonder why we declared and used the viewController object, as we didn’t really need it anywhere. I should say in advance that we’ll use it later, and that’s the reason of its existence. Right next, we’ll see how this class can become handy through code, and how it will become the root view controller of the window of our application. The split view controller has already been added to the app through the Interface Builder, but until now we haven’t been able to use it, because we were performing all the preliminary steps for getting the data, configuring the custom container view and implementing the display of the parsed data. Now that all these are ready, we can start “playing around” with the split view controller, and see step by step various ways to set its appearance. Automatic: If no other specific value is set, this option is used by default. 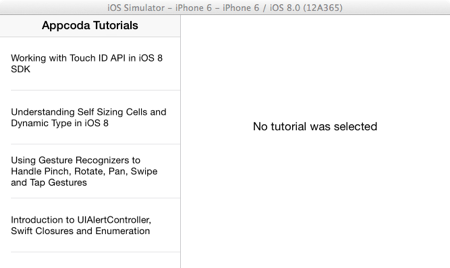 With it, iOS decides the proper way to display the primary and hidden VCs. PrimaryHidden: The primary view controller is hidden. PrimaryOverlay: The primary view controller is placed above the secondary view controller and hides a part of it. In your applications, choose any option that best suits to your design or logic. For now, and for demo reasons mostly, we set this value to AllVisible. Playing a bit with the app, you notice that our XML data parsing works great! The data was downloaded and parsed perfectly, and it’s being properly displayed. Moreover, you see that the split view controller works as a navigation controller, where you can tap on the Back button to go back to the primary view controller, and to tap on any downloaded tutorial topic to display it to the web view of the secondary view controller once again. However, there’s a problem here. In the running app we are not seeing what we were expecting to see, and of course, if we wanted to have a navigation controller we would be using one. Actually, the navigation controller is displayed automatically by the iOS when the two children view controllers of the split VC are not appeared simultaneously (when the primary view controller is collapsed), and it gets disappeared when they are. So, why doesn’t the split view controller display both of its view controllers, even though we set the preferred display mode to AllVisible? Well, the answer exists to the size classes and the trait collections story. To be specific, the split view controller doesn’t work as we expect, simply because the system doesn’t allow it to do so when it is displayed in compact horizontal size class, and that’s the value of the specific trait in iPhone devices. To overcome this, we must override the trait collection of the parent view controller of the split VC, which is our custom container. I believe that is now clear why we used a custom container view controller, and how handy it can be in cases such like this, where we needed to override its trait collection. As you saw, embedding the split view controller to the container view controller, and then overriding the trait collection of the latter wasn’t too hard eventually, and results to the split view controller appearance as shown to the above screenshots. However, in portrait orientation splitting the children view controllers might not be so useful, and that might not be a problem to an iPhone 6 Plus device, but what about the older ones with smaller screen sizes? So, it’s obvious that we should manage the split view in a more refined way, by making it show both of the children view controllers when being in landscape mode. In portrait, we’ll let it use the default behavior, the navigation controller. All that will be achieved by performing a few additions and modifications to the current code. If you remember, we managed to display the split view when we overrode the trait collection of the container view controller. This fact leads us to think that, if we were able to override the trait collection conditionally only when the device is in landscape orientation, then we could achieve our goal. However, that also means that we would need to control in some way the transition between orientations, and then act appropriately. Fortunately, iOS 8 provides a brand new method through the UIKit framework, named viewWillTransitionToSize. This method is called when the size of the currently presented view controller is about to change, and it is the best shot we have in order to control an upcoming orientation change. Now, let’s give a thought to the logic that we’ll apply to that method for a minute. We want to display the split view only when the device is in landscape mode, in other words when the width of the presented view controller is greater than the height of it. If we just had one screen size to all iPhone devices, this would be even easier to check, as we would only need to determine if the screen width is greater than 320.0 points or not. However, Apple now supports multiple screen sizes in iPhone, so we can’t use that approach. Anyway, in the case of the landscape orientation, we will override the trait collection of the container view controller as before, so as we get the desired splitting. In portrait mode though, we’ll use the setOverrideTraitCollection method once again, but this time we won’t override any trait at all; we will just set the nil value to the trait collection parameter, and force that way the container view controller to use the trait collection inherited by the app window, something that will lead to the initial split view behavior (no splitting at all). With the above line, we check if the current vertical size class has the regular value. If that’s true, then the iPhone is currently is in portrait orientation, and is going to transit to landscape mode, so eventually we need to override the trait collection. However, since the size is given as an argument to the method, why not to use it in first place? Either delete it, or comment it out, and you’re ready. Now, if you run the app once again, you’ll notice that the split view is appeared only when being in landscape orientation, while in portrait the default navigation controller is appeared. By default, it returns false, but if you change that you can make the primary view controller the one that will be displayed first after having launched the app. 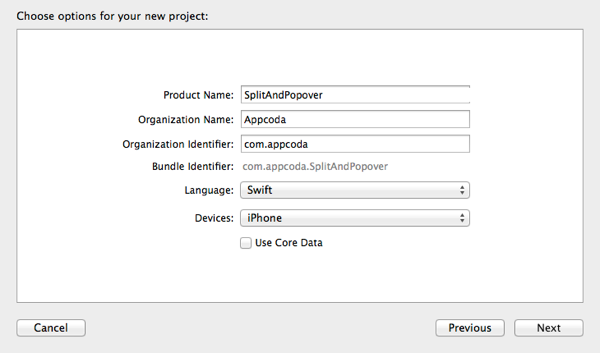 So, if you want add the above method in the AppDelegate.swift file, and test the application once again. Now that we have made our split view controller to properly be shown in each orientation, let’s see how we can hide and show on demand the primary view controller. In iOS 8, the UIKit framework provides a brand new convenient method named displayModeButtonItem. This method returns a bar button item which can be added as an item to the toolbar, and when it is used, it changes the display mode of the split view. This button item is not always visible to the toolbar. The truth is that the system decides whether it should be shown or not, depending on the device type, orientation and size class values, as well as the current display mode value. In our case, we want to use it in order to hide the primary view controller when we tap on it. However, even though it sounds quite simple, it’s a bit more complex in real. That’s because once we manage to change the display mode of the split view, that button item will disappear, so we must create a new, custom bar button item for making the primary view controller visible again. The implementation we’ll see right next will make these two bar button items fully working in all orientations. In case you’ve read the split VC documentation or you have watched the WWDC session videos and you’re aware of the collapsed property, note that what we’ll do here doesn’t change that property, but the display mode of the split view controller. In the above snippet you can see how to create a UIBarButtonItem programmatically in Swift. Notice that in the action parameter, the showTutorialsViewController is the method that will be called when this button item gets tapped, and contrary to the Objective C language, we can omit the Selector keyword here. What this custom method will do is fairly easy (it will just set the AllVisible value to the preferred display mode of the split view controller), so let’s implement it now. All the above are going to perfectly work, but we have a couple of things yet to consider about. First of all, what should happen after the display mode has changed? It’s our job to take care of this and display the custom bar button item that will replace the system’s one. The good news here is that the UISplitViewControllerDelegate protocol gives us one more nice delegate method, which informs us about the new display mode that is about to be applied. Using it, we can send a notification to the TutorialsViewController class, let it know that the display mode is about to change, and ultimately to show the “Tutorials” button item (or the system’s button item if needed again). In the one line existing in the body of the method, you can see how we can post a notification in Swift. Notice that we set the display mode that’s about to be applied as the object of the notification, converted to a NSNumber object. The display mode value is an enum value, so by using the toRaw method we access the actual integer value of it. In the above line, I intentionally used this time the Selector keyword to specify the method that should be called after a notification has received, just to show this option too. As you can see, observing for notifications is easy in Swift too. Our first move in the above method is to get the next display mode value from the notification object. After that, we check how many items currently exist to the toolbar. If you recall, in the Interface Builder we had added two items, the Publish Date button item and the flexible space item. The third item (if exists) is either the system’s display mode button item, or our custom button item which we (will) add programmatically. When any of these two exists to the toolbar, then we remove it so we can insert the new one. Finally, we check what is going to be the next value of the display mode property: If the primary view controller is going to be hidden, then we insert the tutorialsButtonItems at the left side of the toolbar (that’s why it is inserted at index 0). Otherwise, we insert the default display mode button item, and that’s all! Note this: In Swift we can insert or remove items from a toolbar (UIToolbar) in the way shown above. That’s allowed because the items of the toolbar are stored in a Swift array (Array). In Objective C however, we can’t do that because the items of the toolbar are stored to a NSArray array, which is immutable and therefore cannot be modified directly. The above can’t be tested yet, because we haven’t considered the orientation changes. So, we must find a way to control these changes, and then add or remove the proper button item to the toolbar appropriately. 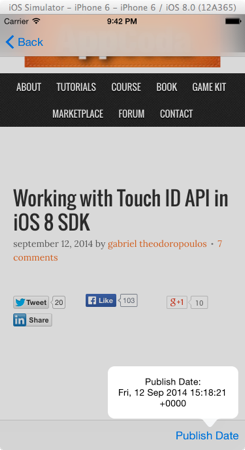 Up to this point we met a lot of new methods (delegate and not) existing in iOS 8. Now, we’re about to see a one more that will help us do what I just described. This method is called traitCollectionDidChange and it must be overridden. This method contains just one parameter, the previous trait collection of the view controller in which is implemented, after a change has occurred. As we have already seen, any trait collection changes happen to the container view controller, but it’s not necessary in this case to implement that method there. We’ll do it in the view controller we are currently in, the TutorialViewController, because it inherits the trait collection of the container view controller. then I should tell that we can only remove from the toolbar only our custom button item. The system’s display mode button item is automatically removed, and if you try to do so the app will crash. Regarding the else case, I don’t think that there’s anything further to be discussed, as we said everything a bit earlier. Now feel free to run and test the app. Play around with the orientation changes and toggle the display mode of the split view controller as many times as you want. Everything regarding its appearance and its behavior is now ready! Up to iOS 7, an UIPopoverController could be used only in iPad devices. However, that’s a fact that belongs to the past since iOS 8, as thanks to the adaptive layout and the new features the UIKit framework supports, popover controllers can now be displayed in iPhone devices too. We have already talked about the adaptive layout, so I would like to mention a couple of words about a new great advancement regarding the UIKit framework, which has to do with the way modal (presented) view controllers are managed. 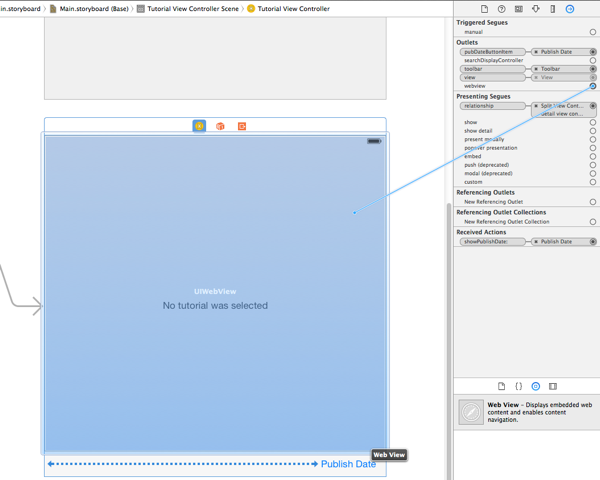 iOS 8 introduces a new class named UIPresentationController, and an instance of this class handles a presented view controller throughout its lifetime. The interesting thing about a presentation controller is that it’s created on the fly by UIKit, once the view controller has been presented. As you understand, a whole new programming stuff such as new methods, properties and protocols have been integrated and provided to developers for usage. Presentation controllers can be used to control and specify various aspects of a view controller, like its style, transition, special properties and a lot more. Keep talking about this new concept would be beyond the scope of this tutorial as there’s a huge discussion regarding it, but I prompt you to read at least this documentation for getting a better taste of it. Also, I recommend again to go through the WWDC videos and watch any related material you find about that topic. As you assume, we’re going to need a new view controller that we’ll use as a popover. So, let’s create one by adding a new class to the project. Go to the File > New > File… menu on Xcode, and create a new Cocoa Touch Class. 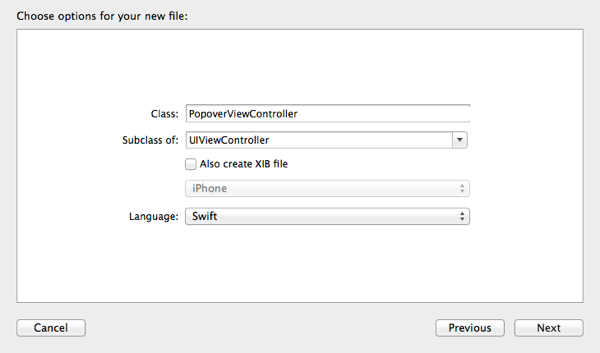 Make sure that the new class is a subclass of the UIViewController, and name it PopoverViewController. 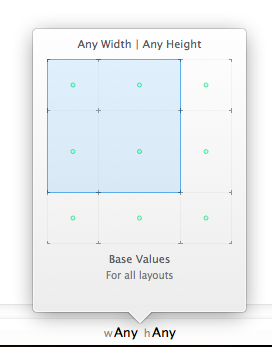 Also, click on the Pin button at the bottom-right side of the Interface Builder to set some constraints to the label. 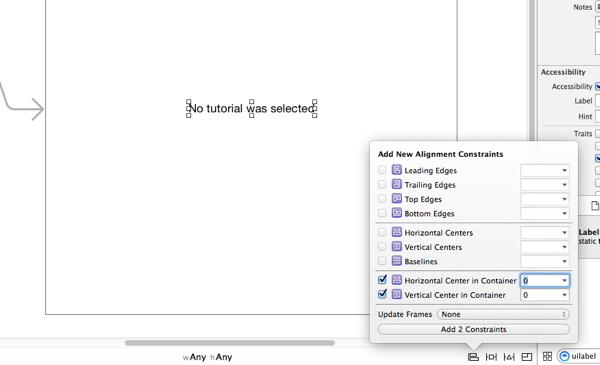 Enable the top, leading and trailing space constraints, and check the Height constraint checkbox as well. Then, return to Interface Builder, and connect this property to the label. Note that we don’t make any connection between the PopoverViewController view controller and any other VC using a segue, as we’ll present it programmatically. We’ll get an instance of the PopoverViewController from the storyboard. We’ll set its presentation style to Popover. Each view controller contains a property regarding the presentation controller. Using it, we’ll make the TutorialViewController class the delegate of this presentation controller. We’ll present the view controller. As you see, we set no text to the popover label yet, and also we didn’t set any other properties regarding the popover appearance (such as the arrow direction). All that is our next step, but I separated the whole implementation in such way, because I want to highlight an important fact: The view controller should be presented first in order for the UIKit to create the presentation controller. All the properties we need to access belong to the presentation controller, which doesn’t exist until the last line of the above snippet to be executed. We’ll “tell” the presentation controller which is the bar button item that the popover should point to (in other words, which is the anchor of the popover). We’ll specify the arrow direction of the popover. That’s important: We’ll specify the content size of the popover. If we skip doing that, then the popover will have an unexpectedly big size. Finally, we’ll set the proper text to the label of the popover. All the above we’ll take place in the above IBAction method as complementary steps. In the above code I access the presentation controller of the popoverViewController object directly, but alternatively we could have it assigned to a local variable. Note that in this case we’re accessing the popover presentation controller property of the view controller, which is a subclass of the presentation controller class. By returning None in this method, we allow the presentation controller to adapt in the layout we ask and display the view controller as a popover. There are other values that can be returned too (there are various enumerations), however we can’t use any of them if we want to keep the normal popover controller appearance. We are ready now! 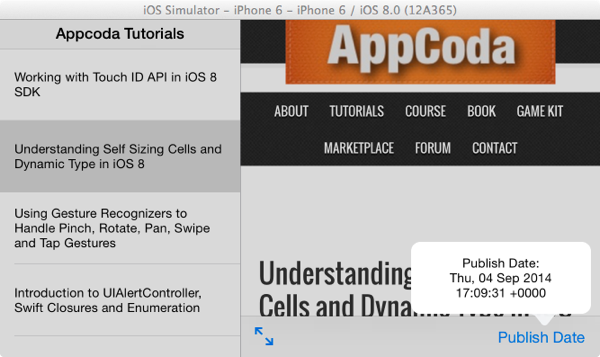 Run the app, and after having selected a tutorial topic, tap on the Publish Date button item to let the popover controller get presented. Test it in both orientations and watch it appearing now in iPhone too! As I said before, note that there are other display styles beyond the popover as well, however none of them makes the view controller appear as a normal popover controller. Instead, they make it appear in fullscreen mode, or over any other existing content on the screen. I’m not going into details about all that, I leave you to do your research and play around with all that stuff if you want. The greatest conclusion that comes out of this tutorial, is that with the adaptive layout the user interface design can now be done on a device-independent basis. Trait collections and size classes provide a brand new way to work with any kind of device, and things seem to be easier than they used to be in the past. Moreover, through this tutorial we saw how view controllers that were initially meant to be used only in iPad can now be integrated in iPhone applications too. New technologies and features, such as the presentation controllers, allow all that to become true, and surely there are still more to explore. Anyway, beyond the implementation of the split view controller and the popover controller, the two concepts that were our main goal here, we also met and learnt how other interesting stuff work in Swift, such as the XML data parsing, posting and receiving notifications, etc. I’m closing by simply saying that I hope you found this post useful and interesting, and of course, use the comments area for sharing your thoughts. Your feedback is always welcome and helpful! Awesome Tutorial !!! Really helpful . Thanks alot. You’re welcome! I’m glad it helped you. is without !, it would cause an exception while running. Hi Gabriel, I firstly want to say nice tutorial. Seems like I misstepped somewhere, and it seems too exhausting to think about backtracking an hour or two worth of code and steps to try and find where I went wrong (it may be obvious just by reading at the exception, but it doesnt yet mean anything to me). If I can suggest, for possibly future tutorials of yours, to maybe break the pace a bit every now and then and run the application at more frequent points just so we can test our code and see that things are working as expected at relevant points. Its also nice to, after working in a file or adding a chunk of code, see immediately what effect that had in the running of our app – if and when its possible. First of all, you’re right to what you said, but in this particular tutorial it was hard to build and run until a specific point to be reached. Surely running the code every while has better results, but it depends on the topic I’m working on. Regarding your problem now, make sure that in the Interface Builder you’ve set the identifier value (the “idCell”) of the prototype cell. Just select the cell, open the Utilities pane, go to the Attributes Inspector, and locate a textfield named “identifier”. In there, just write the “idCell” value, and you’ll probably be fine. I’m glad that the tutorial helped you. Keep up the good work! will it be possible to fetch image thumbnails for the table view?i mean apart from title and description in the first table view controller? Of course you can download images and set them to the tableview. However, that depends on the data the XML feed returns. If the XML you’re parsing data from contains links to images, then you can get them (probably using a secondary thread if there are too many, but don’t forget to update the table view in the main thread). 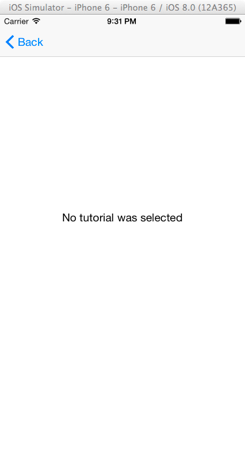 Please stop writing tutorials in Swift. It’s getting fu**ing annoying. Horrible language. Hey, great tutorial. 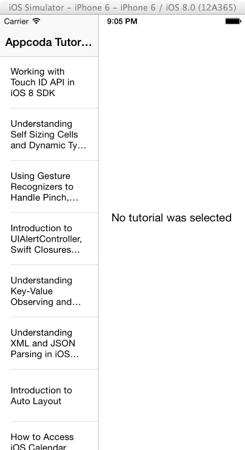 I have been looking for RSS tutorials using Swift, so this is a great help. I’m not sure if I’m misunderstanding something but is it possible to add more than one url source for the rss feed? So, essentially to have two (or more) separate websites providing RSS data from their respective websites. Furthermore, would it be possible to enable a function that allows the end user to manually add their own urls for additional rss feeds? If so, how could that be done or would that break the function of your RSS reader as outlined in your tutorial? Yes, you can add more than one feed, you just have to initialise two parser objects and specify the proper URL to each one. You can’t do it using just one object, as the NSXMLParser class can download data from one URL only. Once you get the data from one, two, or even more websites, it’s totally up to you how you’ll handle it. About your second question, yes, it’s possible to let users add their custom URLs for additional feeds. Once a user types a new URL, then create a new XMLParser object providing it with that URL. From there on, you can do whatever you want. Hello Gabriel. Thanks for this awesome tutorial. Just one thing to commment. Don´t we need to declare the UITableViewCell instance as “var” instead of “let” ? You have declared it as “let” but from what I have understood, this way won´t allow you to modify the cell properties, besides while debugging I found that the cell instance is always nil. I changed to “var” and it´s working now. You’re correct to what you’re saying. I declared it as a “let” just because I didn’t modify any cell properties, I only set the text to the cell’s label. As you said, by declaring it as a “var” the tableview cell allows you to modify it. It seems that I omitted to underline that. halfway thru the tutorial and I have to say job well done bro! Tutorials like this are what we need – some true real world kind of stuff. Looking forward to your future posts! Thanks for the very interesting tuto. You set the horizontalSizeClass to Regular. So why there is a split for vertical orientation? Explained in details and filled with interesting notions. Thank you for all the work. Also, a pro-tip: in showTutorialsViewController method you can set the prefferedDisplayMode property in an animation block of 0.2 seconds. This makes the transition smoother, as it is when it opens. Some feedback/request. Since a lot of the tutorials you have on the site have a large length, you could make some sort of a “Navigation menu” on the right, with the subtitles of the tutorial and the comments section. Moreover, the code snippets aren’t the greatest, since sometimes you can’t see all the code and they aren’t scrollable (Safari v7). It would be great if they were at least resizable. Lastly, kudos for reading all the comments and responding to every one of them. How would I get the Tutorials button/expand button to work on an iPad? Hi Scott, did you have a reply for the problem of ipad ? Eυχαριστούμε από Ελλάδα για τα δυνατά tutorial σου.Κατάφερα να χτίσω μέσα από την σελίδα αυτή τις πρώτες μου εφαρμογές και μάλιστα η μία από αυτές να μπεί στο Top15 του ελληνικού store.Συνεχίστε την δυνατή Δουλειά! Really helpful tutorial, thanks for it! I have a question, maybe a stupid one (I have started developing in iOS a few weeks ago), in the official documentation we can read this recommendation “A split view controller must always be the root of any interface you create”. But in this case the split view controller is embedded in the custom ContainerViewController which is the real root… is the best way to archive this? /SplitAndPopover/SplitAndPopover/TopicsTableViewController.swift:21:49: Value of optional type ‘NSURL?’ not unwrapped; did you mean to use ‘!’ or ‘?’? Me too, any idea to fix it? Woah, Thanks for the help it works now! The drop box file isn’t available anymore. any idea how to fix the incompatible type error for traitCollectionDidChange? I’m getting the same issue and the replacement file isn’t there any more. Any chance you could put it back up? There first condition is about (currentElement == “title” && currentElement != “Appcoda”) … it looks like a little mistake because i checked the XML data and there a single line AppCoda. I have a question when managing the parsing. Could you also please post the tutorial for how to enable the comments in the app. Thanks again for this great tutorial. Thx for your great tutorial. 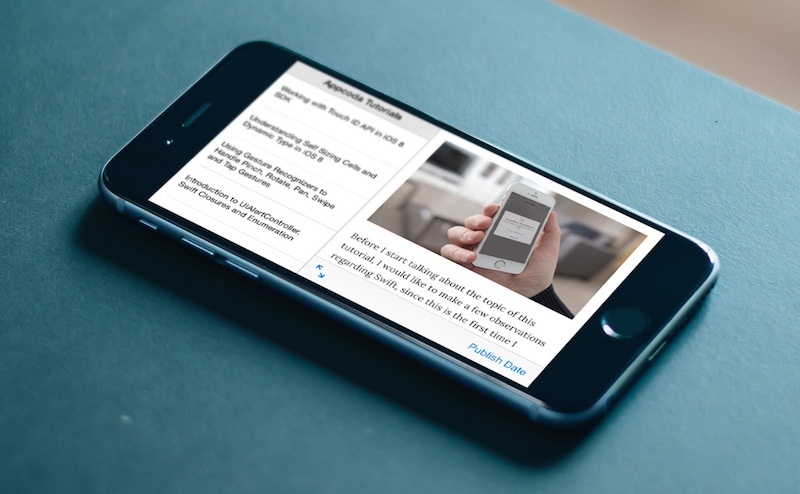 I was really impressed by possibilites of SplitVC on iOS 8. It would be great to support rotation: I mean if PopoverVC was visible in Landscape mode, how to present it in Portrait mode, if it was displayed in previous orientation (or as it should be said canvas size:) ). Thank you so much for this great tutorial, I learned a lot while following it! Thanks for posting this solution. Well Appreciated ! thanks for your really nice tutorial. Everything works fine, but I have to develop for iPad, and i tried everything. There’s a problem with “tutorialsButtonItem” and “displayModeButtonItem” which don’t appear. I put “ipad” in “General” and simulate on “Pad2” and no button on screen. Have your an idear ? I am new at developing. I downloaded and try to run it using xcode 6.3 and getting a bunch of error. Is it just me ? This tutorial is very useful for me, thank you for your sharing. Thanks for really nice tutorial.But I have doubt about xml parsing. Now if we need to access the id and name of node with in the node . How do we differentiate between id and name present in category node outside subcategories. Great tutorial, but how can we make the rss feed not use contentsofurl, and pull data asynchronously instead of synchronously so that the main thread isn’t blocked? Hello,one question,how to add image in each cell for every news? Hi, I have run into a problem. I got as far as the part where I run the program for the first time and it fails “Terminating due to uncaught exception – reason: Storyboard … doesn’t contain a view controller with identifier ‘idSpltViewController'”. I have gone through the code and it does not mention anywhere were we have to set that identifier name? I have tried setting a VC to that identifier, still the same problem. You uploaded wrong project as source code. Good tutorial !